Citation Information: J Clin Invest. 2018;128(8):3460-3474. https://doi.org/10.1172/JCI120555. In type 1 diabetes, cytotoxic CD8+ T cells with specificity for β cell autoantigens are found in the pancreatic islets, where they are implicated in the destruction of insulin-secreting β cells. In contrast, the disease relevance of β cell–reactive CD8+ T cells that are detectable in the circulation, and their relationship to β cell function, are not known. Here, we tracked multiple, circulating β cell–reactive CD8+ T cell subsets and measured β cell function longitudinally for 2 years, starting immediately after diagnosis of type 1 diabetes. We found that change in β cell–specific effector memory CD8+ T cells expressing CD57 was positively correlated with C-peptide change in subjects below 12 years of age. Autoreactive CD57+ effector memory CD8+ T cells bore the signature of enhanced effector function (higher expression of granzyme B, killer-specific protein of 37 kDa, and CD16, and reduced expression of CD28) compared with their CD57– counterparts, and network association modeling indicated that the dynamics of β cell–reactive CD57+ effector memory CD8+ T cell subsets were strongly linked. Thus, coordinated changes in circulating β cell–specific CD8+ T cells within the CD57+ effector memory subset calibrate to functional insulin reserve in type 1 diabetes, providing a tool for immune monitoring and a mechanism-based target for immunotherapy. Identification of antigen-specific CD8+ T cell subsets. (A) Representative staining of PBMCs with peptide-loaded HLA-A*02 and HLA*A-24 tetramers to identify CD8+ T cells specific for β cell and virus epitopes. 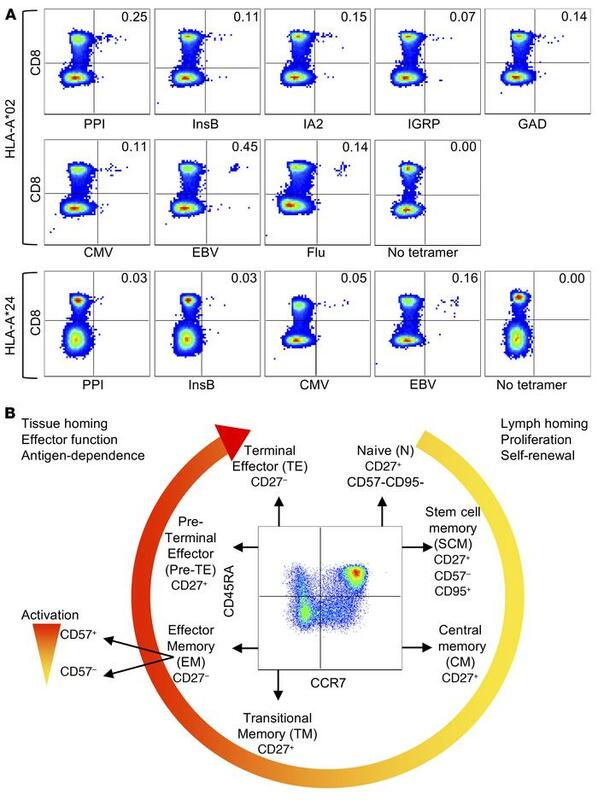 Tetramer-positive CD8+ T cell frequencies were calculated as the percentage of the total CD8+ T cell population and are displayed in the upper right quadrants of the flow cytometry plots. (B) Schematic of the CD8+ T cell subsets analyzed and the cell surface markers used for their definition.